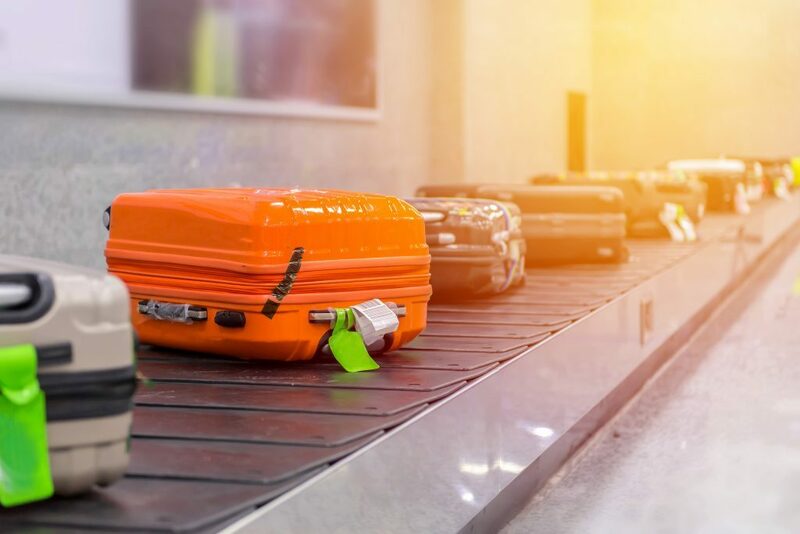 Travelpro vs Samsonite Luggage - Who Makes the Best Luggage in 2019? If you compare Travelpro vs Samsonite luggage, you’ll find a variety of suitcases the look great and function well. Plus, their prices won’t leave you with an empty bank account. Buying luggage can be tough, considering all the different brands out there. But if you pick two popular ones to start with, this cuts down on the stress. Samsonite or Travelpro are both great brands, with a variety of suitcase types and models to choose from. If you compare Travelpro vs Samsonite, you’ll find many similarities, along with a few specific differences to help you make your decision. One of the best things about these two brands is that they don’t cost too much money, so they are great for those shopping on a budget. And despite the low price, they’re still durable, look great, and function perfectly in almost any situation. Samsonite vs Travelpro – Which Brand Makes the Best Luggage? The best hardside suitcase is made of durable materials that won’t bend or break at the slightest bump. They offer more protection than any other type of suitcase around, so can carry more of your delicate items, as long as they are packed properly. The downside of these types of bags is that they are rigid, so can’t be stuffed extra full if you feel you need that extra pair of pants on your trip. Hardside luggage comes in all sizes, from the huge suitcases to the smaller carry ons. They are best for those who are planning on checking their bags since even the roughest baggage handlers won’t be able to damage these bags. They are also good for anyone who likes secure and stress-free travel. 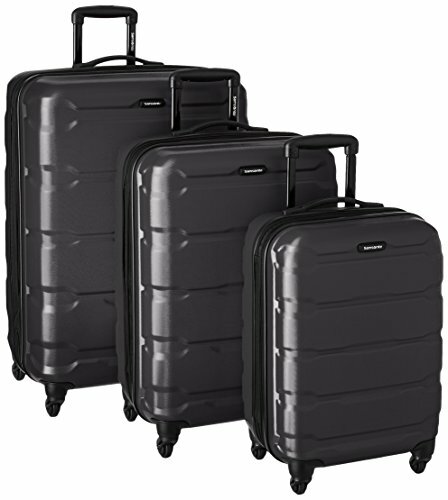 The Travelpro Maxlite 4 hardside spinner bags come in three sizes, the 21 inch, the 25 inch, and the 29 inch suitcases. All three are made using the same shell materials, called ChromaShift. This is a proprietary plastic composite, which is extremely lightweight. But this material is also quite durable, resisting dents and scratches during your travels. Another interesting feature of this material is its color-changing ability, which is altered depending on the lighting where your bag is placed. 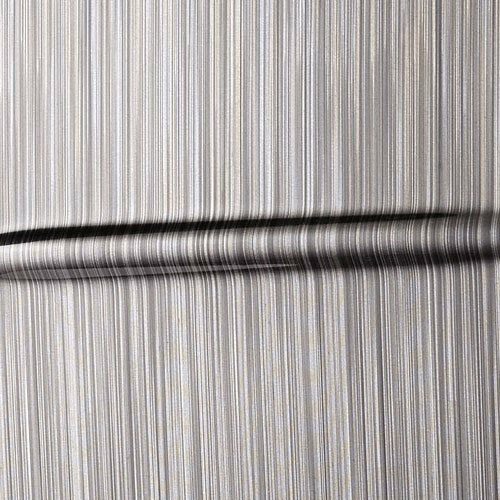 The telescopic handle is made of airline-grade aluminum, so it won’t bend or break at the slightest bit of pressure. This handle locks at both 38 inches and 42.5 inches, so you can place it where it is most comfortable for your height. Travelpro’s patented Contour Grip fits nicely in your hand for increased comfort while you pull your bag. The dual spinner wheels rotate a full 360 degrees for easy maneuvering through tight spaces and around sharp turns. Plus, each wheel rolls independently, giving you more control over rougher surfaces. 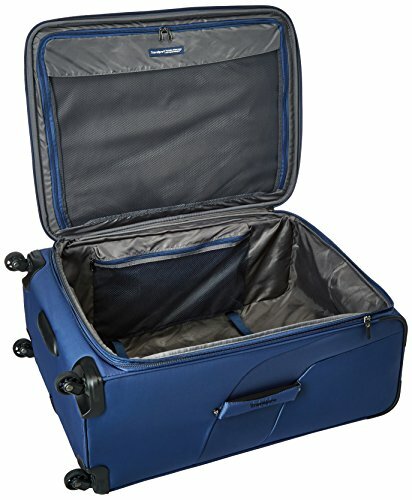 When you open up this Travelpro hardside luggage, you’ll notice two separate compartments, one on the bottom and one in the lid. The bottom space is perfect for your larger items, all of which are held in place by compression straps to keep them from shifting during your travels. This reduces the risk of wrinkling. The lid has plenty of room for other clothing or smaller items. There is a divider to hold these items in place, making it easier to organize your clothing by type, or keeping the dirty ones separate from the clean ones. On this divider are two zippered mesh pockets for your toiletries, socks, or other smaller items. There is also a smaller mesh pocket between the two compartments for the extra little items you don’t want to lose among the larger stuff. 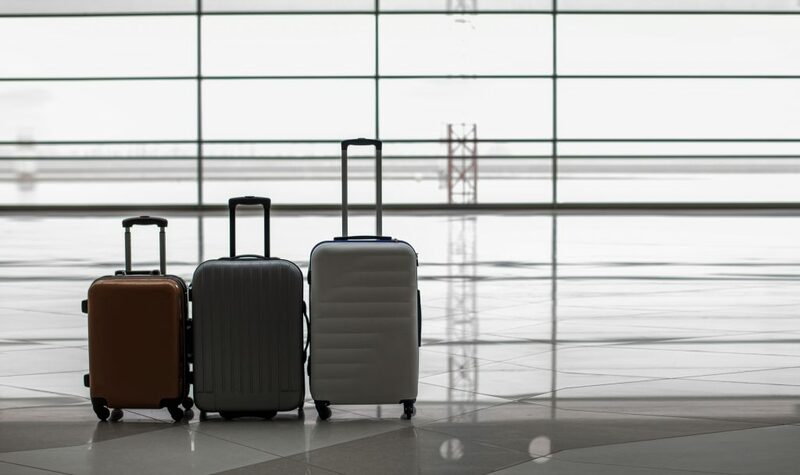 Along with the telescopic handle, there are also two carry handles located on the top and the side of all three sizes of these Travelpro suitcases. These are both low-profile handles, fitting nicely against the bag when not in use, but expanding to fit your hand when it comes time to carry your bag. There is also a bottom handle cup for lifting the bag out of the trunk or into an overhead bin. Next to the main zipper is another one, which allows you to expand these bags up to 2 inches. This makes it easier to pack an extra sweater or two, or a few souvenirs you may have picked up during your trip. For extra security, there is a TSA lock on the top of the bag. This combination device locks your zipper tabs in place so your bag can’t be opened. But there is also a keyhole for TSA officials to use if they need to access your bag for routine checks. The divider panel and compression straps keep your belongings organized, separate, and in place through your entire trip. If you’re comparing Travelpro luggage vs Samsonite luggage, this is a good place to start. Like the Maxlite 4, the Omni PC Spinner also uses polycarbonate. 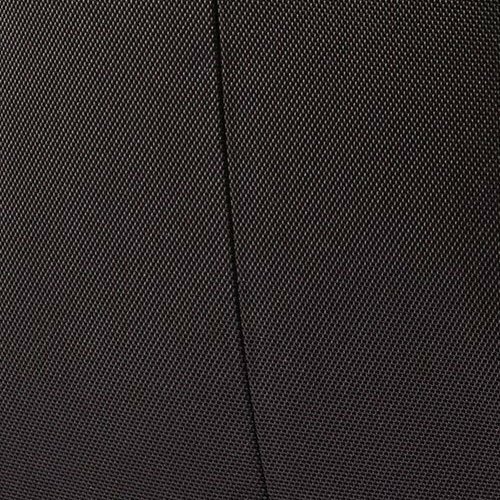 Their version of this material has a micro-diamond texture, which resists scratches to keep your bag looking great even after multiple trips. This material is also strong enough to withstand all but the hardest impacts, so it retains its shape with no dents to speak of. Polycarbonate is also lightweight, so you won’t have to limit your gear just to stay under weight restrictions. The spinner wheels have also been redesigned to keep them as light as possible, with protective housing around them to help reduce wear. They roll smoothly in any direction, so you never have to struggle with your bag in a tight space. When it comes to organization, Samsonite vs Travelpro are pretty similar. 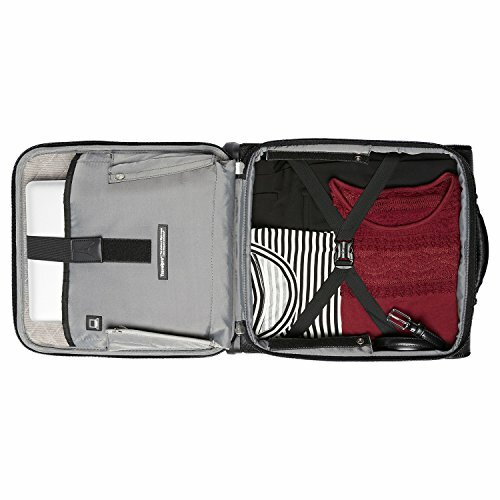 The Samsonite Omni PC has a large main compartment, with a second one in the lid. The main area is open, with compression straps that snap together, holding everything in this area in place. The lid area is also roomy, with enough space to store a few shirts, skirts, sweaters, or anything else you want to keep separate from the rest of your clothing. There is a large mesh divider that zips over this area, closing it off and keeping your belongings sorted the way you placed them in there. The divider lacks the pockets found on the Travelpro hardside spinner, but it does have a small zippered pocket for a few little items you need on your trip. 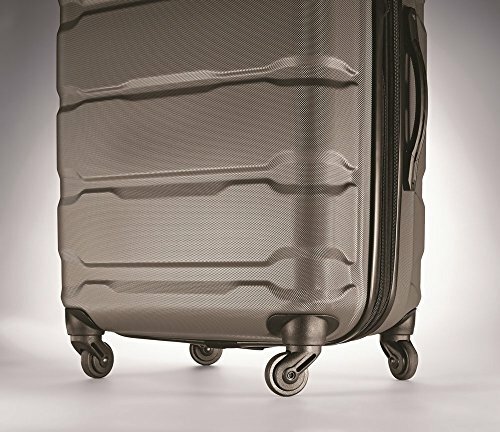 There is a retractable handle on the Samsonite hardside luggage that locks in both the extended and stored positions, though you can’t lock in a specific height. This handle stores nicely into its own recessed compartment when not in use, so it’s out of the way. 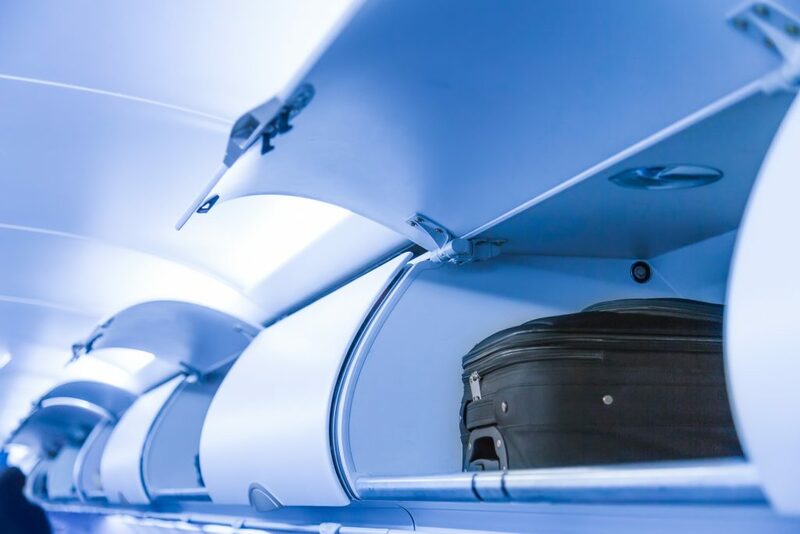 There are also carry handles on the top and side of Samsonite luggage, which sit close to the bag but expand slightly to fit your hand when it comes time to pick it up. There is a TSA lock on the side to increase security for your belongings. This handy device holds onto the zipper tabs, keeping them closed at all times. To open it, you just put in your combination code. This lock also allows TSA officials access to your bag if needed. 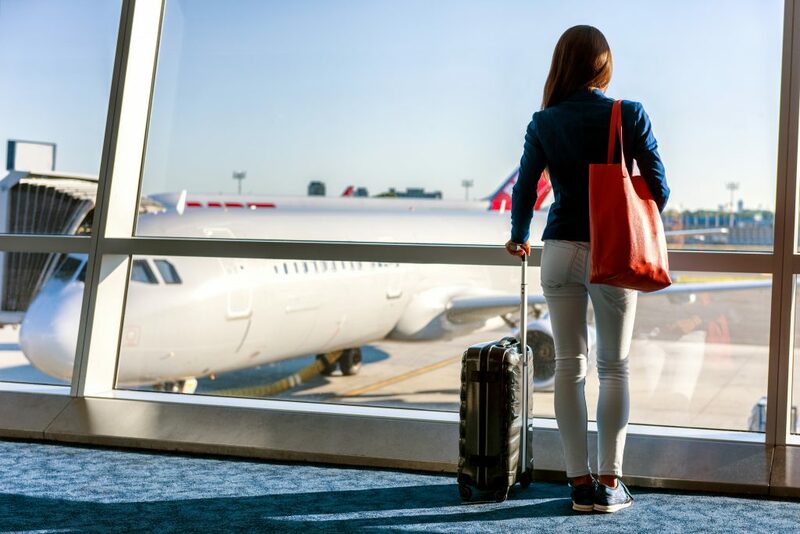 There are both compression straps and a divider inside to keep your clothing and other essentials in place and organized, even if your bag is jostled during your flight. The four spinner wheels rotate in all directions for quick maneuvering. A zipper on the outside of the bag also allows you to expand it up to 2 inches for a bit more room inside the bag. Softside luggage is big and roomy like hardside models, but with a softer material that is lighter and more compressible in tight situations. They usually have multiple pockets for easy storage of almost anything you need, and come with or without wheels, depending on the bag you choose. These are great for those who don’t pack their most delicate items, so if the bag gets tossed around a bit, nothing gets broken. If you’re the type of traveler who likes to be prepared for any occurrence, they also have the room to accommodate your extra gear without putting you over any weight restrictions. To see the best models, check out our Travelpro vs Samsonite luggage comparison below. 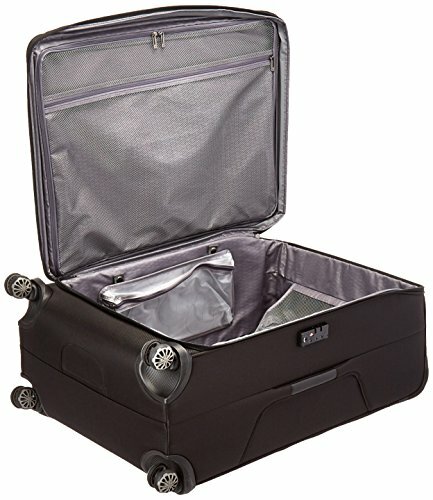 The outer shell of this lightweight Travelpro suitcase is made of durable polyester, which resists tears and has a stain-resistant coating for a cleaner bag, no matter where you travel to. Inside is a honeycomb frame system which increases the strength of the Travelpro Maxlite line without adding extra weight to the bag. Travelpro has also added their own bottom tray alignment and stabilized wheels. This helps add even more durability to this softside bag while increasing the maneuverability. This means that even in a crowd, you’ll be able to make quick turns without bumping into anyone around you. There is a telescopic handle, which uses airline-grade aluminum for maximum strength, even if your bag is filled to capacity. This handle has Travelpro’s patented Contour Grip, which is comfortable in your hands, even if you’re pulling the bag from one end of the airport to the other. The grip also gives you more control since it won’t slip in your hand, even if you get a bit sweaty. 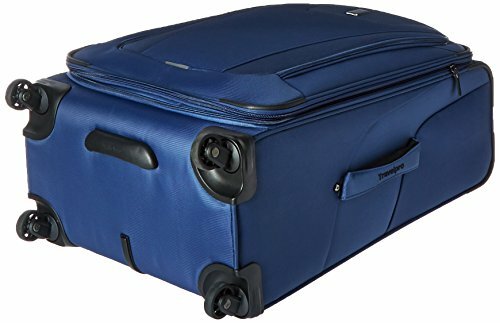 All three sizes in best Travelpro spinner luggage line have one main large compartment, which is roomy enough to hold everything you need, including pants, shirts, sweaters, and pjs. There is also a large mesh zippered pocket on the inside of the lid, to hold any of the items you’d like to keep separate from your larger belongings. A small pocket on the side is perfect for your little items, like toiletries, makeup, or a few accessories. For even more storage, there is a large zippered pocket located at the front of the bag. This exterior pocket is big enough to hold an extra sweater, a few books or magazines, or anything else you may need to keep accessible during your trip. This way, you won’t have to rummage through your bag in public to find that one handy item. 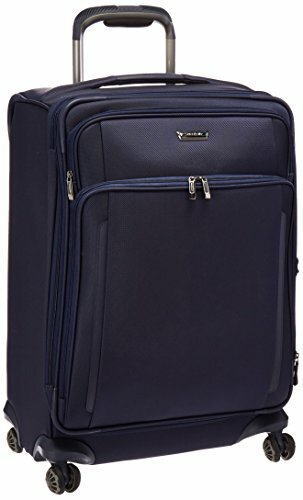 The telescopic handle on the Travelpro Maxlite 4 21″ Expandable spinner, plus the two other sizes in the line, locks at both 38 inches and 42.5 inches. This allows you to adjust it to your height and keep it there, with no shifting as you walk. There are also carry handles on the top and side of these bags, for those times when wheeling it just isn’t an option. A bottom handle cup makes it easy to lift it off the ground with no struggling to find a handhold. The four spinner wheels rotate in all directions for quick turning in any situation, plus make it easy to pull your bag on two or four wheels. All of them have protective housing to reduce damage caused by an impact. These bags are all expandable, with a tapered expansion zipper that opens up the bag an extra 2 inches. This gives you more room inside the bag for those extra few items, while still allowing the bag to maintain its low center of gravity. The zipper pulls on all three zippers are ergonomic for easy grabbing and top-strength for extra durability. The best Samsonite spinner luggage works well in all situations, and the Silhouette XV Softside bags meet these needs. The outer shell is made of rugged Tri-core nylon, which is durable enough to withstand a bit of rough handling with no tearing or puncturing. This material also has a SamGuard coating, is water-resistant, protecting the bag and its contents from spills and rain. The Tru-Trac wheel system is uniquely designed for a better roll, no matter what type of surface you’re on. This system incorporates a V-shaped design, which uses cambered castors to keep your wheels pointed forward, even over rougher terrain. This reduces the strain on your body since you won’t need to twist and pull to keep your bag rolling. The wheels are also surrounded by protective housing, which increases the strength of the wheels while preventing damage from impact. If you’re looking at Travelpro vs Samsonite softside luggage, the latter brand has a bit more storage to speak of. The Samsonite lightweight spinner has a large main compartment for your larger items, like clothing, books, or other necessary gear. There is also a large zippered compartment in the lid for your other items. Though the Silhouette Xv Spinner 19″ lacks this feature, the larger sizes have a lightweight organizer which is meant to hold onto a hanger. This keeps your dressier items from wrinkling during your trip. There is also a mesh zippered pocket on the front of the larger zippered divider for belts, ties, or other necessary items. Each of these bags comes with a WetPak pocket to keep any liquids or creams away from your clothing. This little pouch snaps into the inside of the suitcase and is removable for added convenience. On the exterior of the bag is a large zippered pocket, a medium zippered pocket, and a small slip pocket. This makes it easy to organize the items you need to keep close at hand, such as extra shoes, a jacket, magazines, or documents. The RightHeight Pull Handle System on this Samsonite lightweight suitcase locks at every inch, which makes it easy to adjust it to the right height. This also gives you the most amount of control for better maneuverability while reducing strain on your arms and shoulders. This handle also has deluxe cushioning for a comfortable grip. For more carry options, there is also a carry handle on the top of the bag and another one on the side. These are both padded to reduce sore hands and blisters if you have to carry your bag over longer distances. Cross straps inside the bag help to keep your larger items from shifting around during your travels. This also keeps everything wrinkle-free and organized since it all stays exactly where you put it. The larger 25 inch Silhouette XV model also includes a Travel Sentry combination lock, which keeps your belongings safe when your bag is out of sight. It locks the zippers on the main compartments, though the other front zippered areas are not secured, so you may not want to put anything you don’t want to lose in those areas. For a similar model that has many of the same features and materials as the Silhouette XV, check out the Samsonite Silhouette Sphere 2. It is roomy and lightweight, with a cheaper price tag for those on a budget. The best carry on luggage can come in both hardside and softside, with or without wheels, the choice is yours. The beauty of these bags is that they are small in size and lightweight, but still have enough room to store your most important items during your flight. You can use them to hold a few things to occupy yourself on the plane or while you wait to board. Plus, they have room for a change of clothing and a few toiletries, makeup items, and styling products. There is even room for snacks. If you’re traveling for only a day or two, the right carry on can replace a larger bag as well. This means less time spent at baggage claim and less money spent on checked bags. There are many reasons why the Crew 11 line is the best Travelpro carry on luggage available. To start with, it uses ballistic nylon for the outer shell, which is extremely durable, resisting tears and punctures better than other fabrics. This shell also has a DuraGuard coating, which repels moisture and stains. The coating also protects against abrasions for an even stronger bag. The PowerScope extension handle is a patented design from Travelpro, made of quality aluminum. It locks in three separate places for the right height, with no wobbling, even at the highest setting. The Contour Grip is also patented by this company, providing you with a soft, comfortable grip that won’t slip in your hand. The dual spinner wheels feature MagnaTrac technology, which allows the wheels to align themselves on any type of terrain. This keeps then pointed straight, no matter which direction the bag is pointed. Protective housing keeps the wheels and corners damage-free. When it comes to organization, it all depends on the bag you pick. 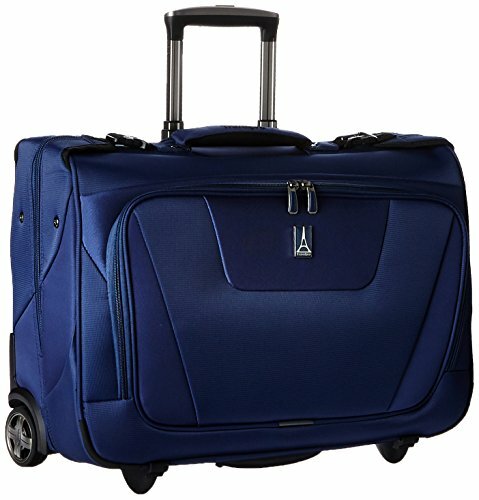 The small Travelpro Crew 11 Spinner Tote has a large main compartment inside, with a padded laptop sleeve on the lid. The laptop is strapped in with Velcro to keep it from sliding out if the bag is opened. The exterior pocket has another padded space for a tablet, plus organizational pockets for phones, cords, pens, plus a keychain clip. There is also a small pocket on the side of the bag. 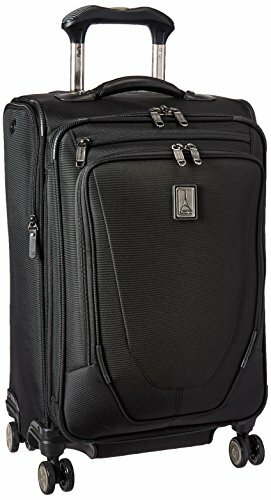 The Travelpro Crew 11 21″ Expandable Spinner Carry on Suiter and the Crew 11 International Carry on Spinner bags lack the laptop and tablet sleeves, and the organizational pockets in the front area. But they still have plenty of storage, including a large mesh suiter bag that fits into zippered mesh area beneath the lid. There are also two smaller zippered pockets on the side of the main compartment. On the outside of these two larger carry ons, there is a straight zip pocket beside the main zipper, and a U-zip pocket on the outside, both of which hold those items you need close at hand. There is also a side pocket with a special feature described below. There is one feature found on the larger two Crew 11 carry ons that you won’t find on most of the other brands available. This is the external USB port found in the side pocket. 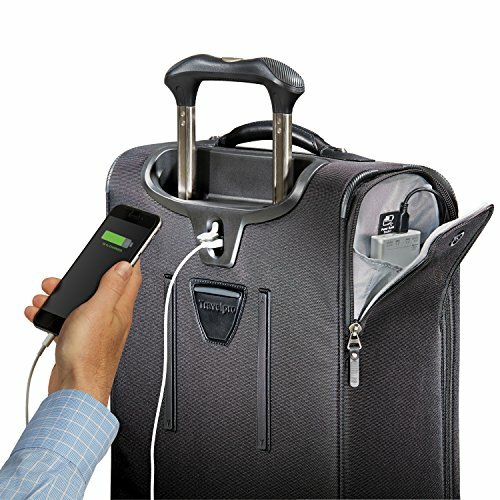 This allows you to hook a power bank up directly to your bag, securing it in the zippered pocket so it won’t be lost during your trip. There is also a second USB port beneath the telescopic handle of the bag, which you can connect to a smartphone or other device. This way, you can charge it while you wait for your flight. 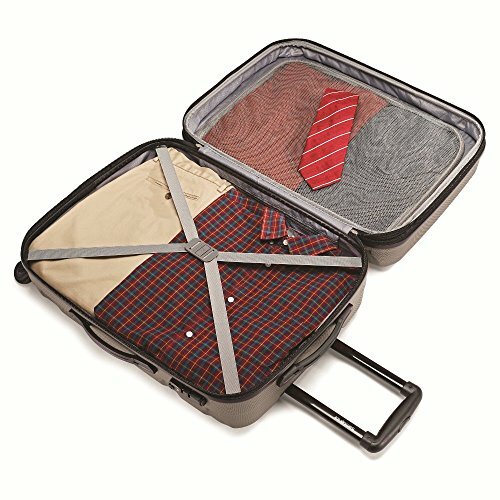 The garment bag in the two larger Travelpro carry on spinner bags keeps your clothes free of wrinkles. These two bags are also expandable using the zipper on the side. There are compression straps on all three bags in this line, plus they have premium leather, low-profile handles on the top and the side. A bottom handle cup eliminates the struggle of lifting the bag. 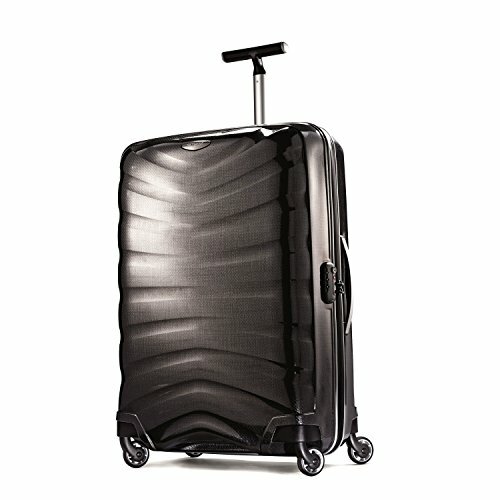 If you’re checking out Travelpro vs Samsonite spinner carry on bags, the first thing you’ll notice is the shell. Unlike the softside material used on the Crew 11 series, the Samsonite Winfield 2 is a hardside bag. It is made of durable injection molded polycarbonate, which is lightweight enough to keep you below weight limits, while still resisting impacts for a better looking bag. There is also durable housing around the corners, extending down over the four spinner wheels to protect them if you should run into something during your trip. This also keeps them safe if they get jostled in the overhead bin, or dropped when you’re taking it down at the end of your flight. 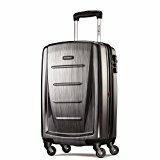 This Samsonite polycarbonate spinner carry on also lacks the outer compartments found on the Travelpro carry ons. But it does have two internal compartments, one main one and another in the lid. The latter area has a zippered divider to keep everything organized during your trip, even during some unexpected turbulence. On the outside of this divider is a couple of mesh pockets to store your smaller items, keeping them from getting lost in the larger clothing. The Samsonite may not have the laptop and tablet sleeves or the garment bag found on the Travelpro Crew 11 models, but it still has some great features that make it a great bag for almost anyone. There are compression straps in the main compartment, which work with the zippered divider to keep everything in your bag organized, reducing shifting and wrinkling. The telescopic handle locks in place when fully extended and when stored, so it won’t shift around during use. There is also a carry handle on top, which sits close to the bag when not in use, but comes out enough to fit your hand comfortably around it when you need to lift it off the ground. The four wheels spin in all directions, letting you pull the bag on two wheels behind you or on all four beside you, whichever suits you best. The bag also has a zipper on the side, which allows you to expand it if you need a bit of extra room inside for those souvenirs you’ve picked up during your travels. One feature this model has that you won’t find on the Travelpro models is the TSA lock. After zipping up your bag, you can lock the zipper tabs into the device. The only way to open the bag again is by putting your code into the combination lock. This type of lock also allows TSA agents access to your bag if needed. 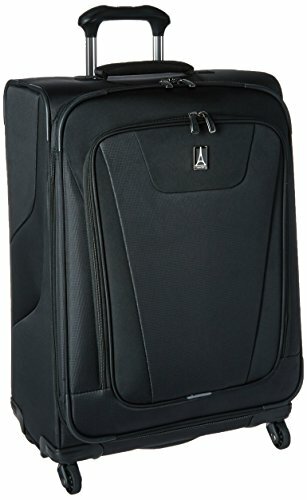 Samsonite Winfield 2 Fashion Hardside 20"
Not everyone needs the best carry on garment bag around, but they do come in handy when those fancier clothing are a necessity. This is because these types of bags are designed specifically to hold suits, dress shirts, skirts, and dresses. They keep the clothing flat, reducing the wrinkles you’d get if you tried to fold these items into a regular suitcase. Garment bags also take it a bit further, adding pockets of all sizes, to hold your nice shoes, belts, ties, and other accessories that complete your outfit. These bags work well for those who need to dress up for work, whether you need these clothes every day or just for meetings. These are also great bags when you have to travel for certain occasions, like weddings, funerals, or even a high school reunion. These bags are usually smaller in size, lightweight, and can be carried on rather than checked. Many of them even come in wheeled or spinner models, to make it even easier to take them with you. There are many reasons why the Maxlite 4 rolling bag is the best Travelpro garment bag available. The first is the outer shell. It is made of rugged polyester fabric, which resists tearing and punctures. For extra protection, there is also a water-resistant coating on the exterior, which also helps reduce abrasions as well as stains. There is a Honeycomb Framing System inside which helps your bag hold its shape. EVA foam offers some protection for your belongings without adding extra weight. The high-tensile zipper pulls are ergonomically designed to fit nicely between your fingers. They also work to give you smooth zipper movement, with no snags when opening or closing your bag. The 2 inline skate wheels are filled with ball bearings for smooth rolling and great performance. These wheels, as well as the bottom corners of the bag, are surrounded by a protective housing to reduce damage from an impact. The telescopic handle is made of airline-grade aluminum, which is sturdy enough to resist bending, even if your bag is filled to capacity. When you’re packing your dressier clothing, you want to make sure it will arrive as wrinkle-free as when you put it in the bag. 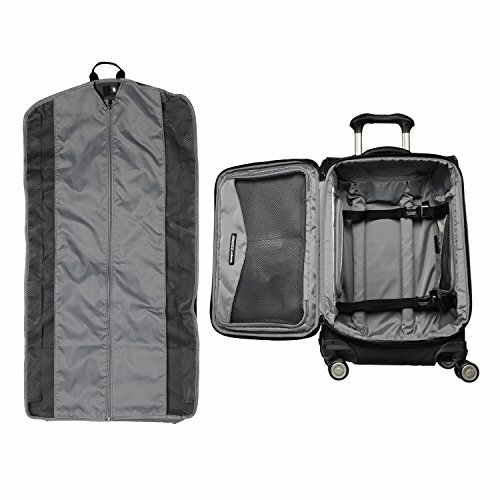 This Travelpro rolling garment bag has a large opening, plus an extender panel for those extra long pieces. There is also a flap that extends the entire length of the bi-fold bag. This flap has multiple pockets, both mesh and opaque, giving you ample room for your shoes, ties, shirts, and any other essentials. For smaller items or toiletries, there are two triangular mesh pockets in the corners, one on each side of the hanger bracket. When you’ve filled your bag with everything you need, just fold in the extender panel, lay the flap over everything and zip it closed, fold your bag and zip it closed as well. For anything else you may need on your trip, such as passports, tickets, magazines, or even an extra sweater, there is an exterior pocket on the front of the bag. 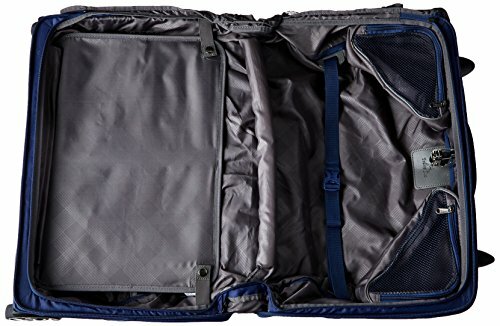 There are a few other features found on this Travelpro carry on garment bag that make it handy to have for more than just carrying your best clothing. Inside the bag, there is a hanger bracket that allows you to take your clothing straight from your closet and put them right in the bag. Then, when you reach your destination, you can take them out again and hang them up. There are also compression straps to keep your clothes from shifting while you travel, reducing the chances of wrinkling even more. The telescopic handle locks in two positions, making it easier to find the right height for you. This works with the two inline skate wheels to reduce strain on your body when pulling it behind you. There is also a top carry handle for those times when pulling the bag isn’t an option. A bottom handle cup gives you a decent grip for lifting the bag, which is essential when trying to fit it in a cramped overhead bin. 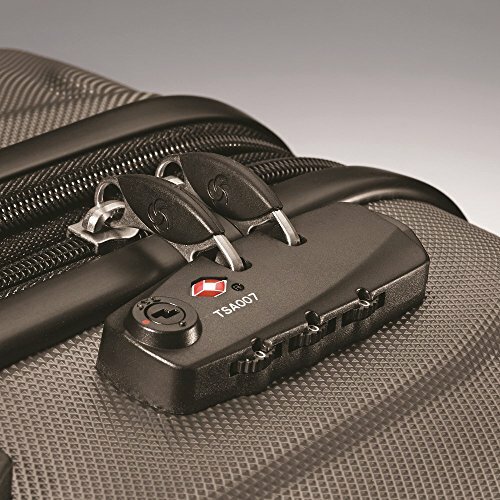 For extra security, the main zippers are lockable, though no TSA-approved lock is included with the bag. 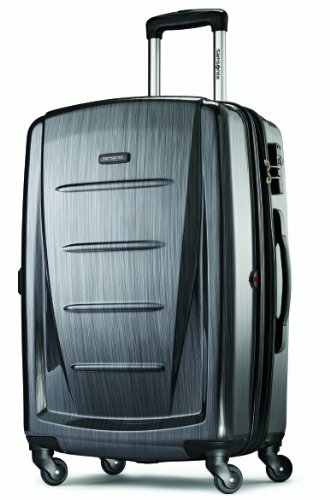 If comparing the Travelpro vs Samsonite rolling garment bag models, you’ll notice a few similarities in these two bags. Like the Maxlite 4 model, the Aspire XLite uses polyester material, which is quite durable, lasting through countless rough trips with no tears or abrasions. The frame uses steel wire construction, which helps hold the bag’s shape while still remaining lightweight. The two inline skate wheels are made of durable polyurethane and filled with ball bearings to reduce friction and resistance when rolling over a variety of different terrains. The corners have texturized rubber housing to protect against wear and tear, even for those clumsy individuals who run into everything in their path. Aluminum is used for the telescopic handle, which resists bending under the pressure of the bag’s filled weight. The Aspire Xlite is lightly lined with nylon. This material is durable, and because it is resistant to stains, it is easy to clean if you should happen to spill something in your bag. 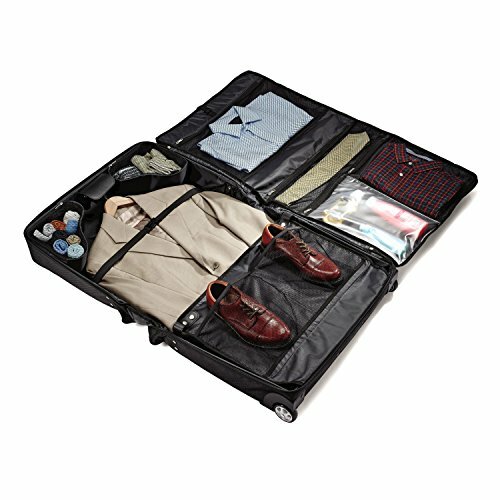 This Samsonite garment bag ensures there is a place for everything you may need. The main compartment holds your suits, coats, pants, dresses, or skirts. There is even an extender panel to help pack your longer items. On the outside of this panel are two mesh pockets, each big enough to hold a shoe. In the top corners of this compartment are two small mesh pockets, perfect for socks, belts, or other small items. There is also a divider flap, with multiple pockets of its own. There are a couple mesh pockets perfect for your dress shirts. There are also two thinner pockets, one mesh and one privacy pocket. And for your liquids and creams, there is a WetPak pocket to keep spills from spreading throughout the bag and over you clean clothing. On the exterior of the bag, there is a large pocket on the front, perfect for holding the items you need easy access to. This means tickets, passports, or magazines and other items you want to keep boredom at bay while waiting for your flight. 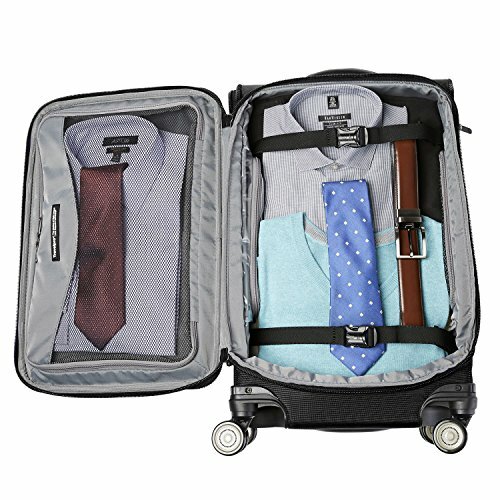 Though the design is simple, without the frills found on some other bag types, this still may be the best Samsonite garment bag around. It uses two inline skate wheels and a telescopic handle for easy pulling over most types of terrain and even up stairs. There is a compression strap inside the bag, which holds your clothing in place no matter which way your bag shifts. A hanger-hook bracket lets you clip a hanger directly into the bag, so you can take them with you rather than worrying about how you will hang your clothing when you get to your destination. This also speeds up packing time since you don’t need to fuss with the hangers on either end of your trip. The zippers are self-mending #10 coil zippers, which are meant to work flawlessly when opening or closing the bag. The main zippers are also lockable, though you’ll need to supply your own TSA-approved lock. If you need new luggage, you’re going to have a tough time picking a favorite. This is because there are countless brands available. Each brand has a few different lines to choose from. And in each line is a variety of suitcase types, all designed to suit a specific need. This makes suitcase shopping extremely stressful. Rather than trying to pick the best suitcase to buy from a sea of luggage, start small. First, search for the best suitcase brands online, or talk to friends and family about what they use. Then start comparing those brands. Pick two that seem similar, like Travelpro luggage vs Samsonite luggage. Then start comparing the two suitcases and their features. If you’d like to know exactly what to look for, you can jump ahead to our buyer’s guide for more help. After a few comparisons, you’ll start to see the things you like about a brand and the things you don’t. This will help you narrow down your search. Do the same for any other brand on your list until you have decided on a favorite brand and line. Now it’s time to go shopping! If you’re going to create luggage, you need to know a great deal about travel, which is why Bob Plath believed he was the right man for the job. Plath had spent years as a Northwest Airlines 747 pilot and saw for himself what the rigors of travel can do to even the best luggage brands he carried. That’s when he decided to create his own line, fixing the mistakes of his predecessors. He began with the Original Rollaboard, which was a wheeled carry on bag. When the rest of the crew began to follow his lead, passengers followed suit in no time. Eventually, Travelpro branched out into garment bags, rolling duffel bags, totes, and many other types of bags and suitcases. Today, their top collections include their Crew line, Platinum line, and Executive Choice models. Their Rollaboard bags are still a top choice, in all of their lines. 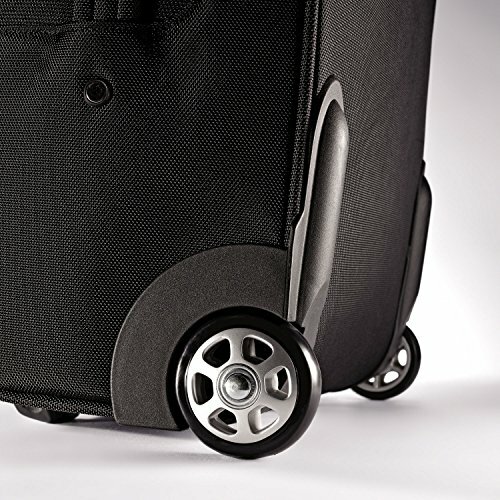 Their expandable spinners are also popular for carry ons and larger suitcases. In 1910, Samsonite was founded in the city of Denver by Jesse Shwayder, who along with his brothers, began with the manufacturing of wooden trunks for travelers of this time. It wasn’t until 1941 that they began to create suitcases, though they still used a wooden frame for these pieces. A few decades later, they introduced their Classic Attache, then came their wheeled suitcases. Locking models, larger sizes, and new innovative materials soon followed, making Samsonite a leader among luggage makers. Their most popular line is the Samsonite Silhouette XV in both the hardside and softside models. These bags are all spinners, with the carry ons, boarding bags, and large suitcases being the top sellers. 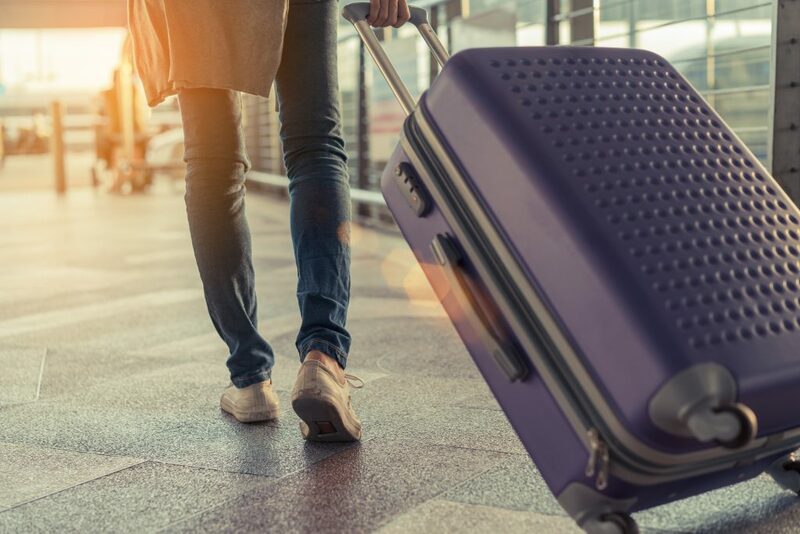 When comparing Travelpro vs Samsonite suitcases, the first thing you need to look at is the types of luggage each brand has to offer. Thankfully, both brands offer a wide variety of suitcases to meet every need. And there are numerous lines from each brand, each with a few sizes and styles to choose from. This makes it easy for a traveler to find the right bag for them. If you need a carry on, a garment bag, a larger suitcase, or a duffel bag, Samsonite or Travelpro will likely have one that meets your needs. And there will likely be matching styles if you are need of a few bags for different types of trips, whether you travel for business or for pleasure. 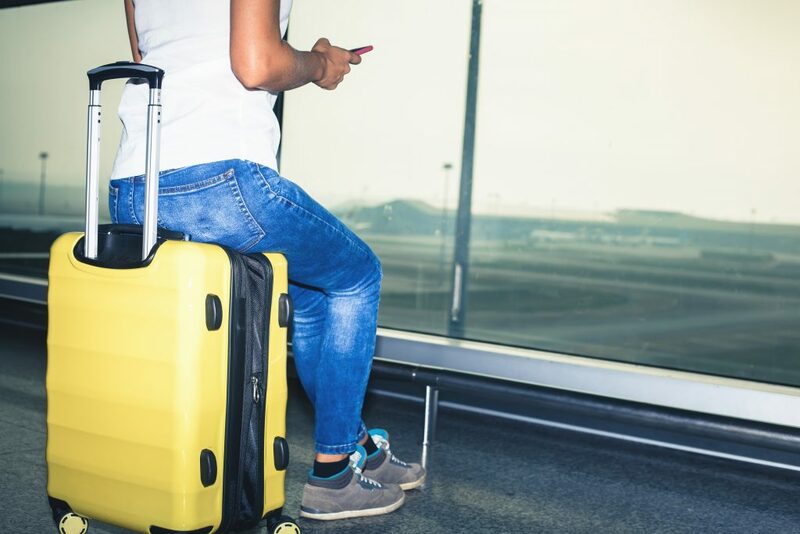 Of course, like most luggage companies, these two brands specialize in carry ons and larger luggage sizes since these are the purchased the most often by their customers. 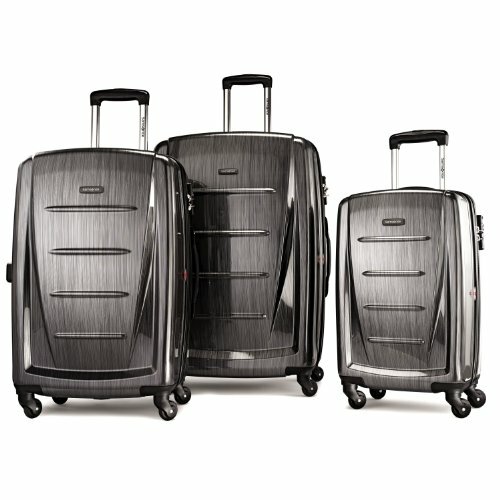 The lightweight expandable spinner models are Travelpro’s most recommended styles in these sizes. The spinners are also favorites of Samsonite’s supporters, in both their hardside and softside lines. When it comes to sizes, you won’t find too much of a difference when checking out Travelpro vs Samsonite. This is because both brands know what their customers need and what airlines allow. For this reason, they keep their sizes within certain ranges. For instance, the carry on sizes for Samsonite or Travelpro are usually about 20-21 inches. These small bags need to stay within airline regulations, so can’t really stray too far out, or they will be of no use to their customers. Both brands have mid-size bags of about 24-25 inches. These are great for shorter trips of a weekend or up to a week, provided you aren’t the type to change three times a day. The largest sizes these companies offer are 28-29 inch bags. These are necessary for longer trips of over a week, or when you’re packing for two people on shorter trips. This lets you stuff more in without adding too much extra weight or getting that extra checked baggage fee. 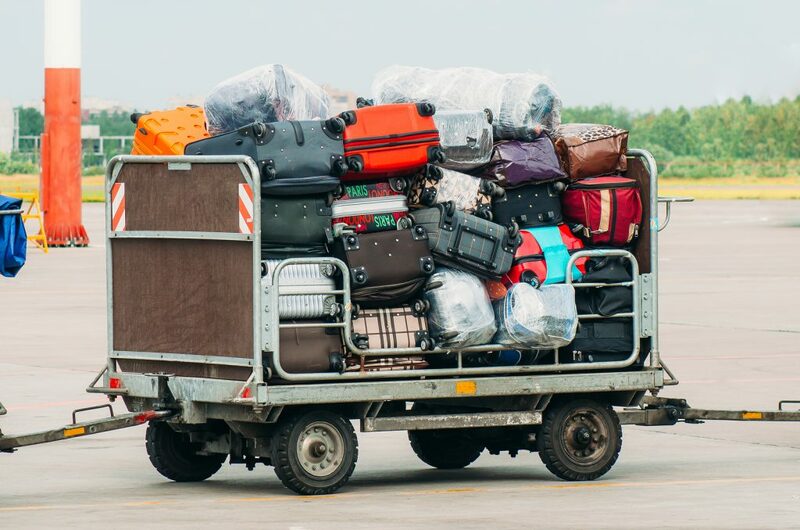 Lightweight baggage is a necessity, especially since airlines have restrictions on how much you can carry with you. That’s why both Travelpro and Samsonite have created the lightest bags possible to meet these rules. 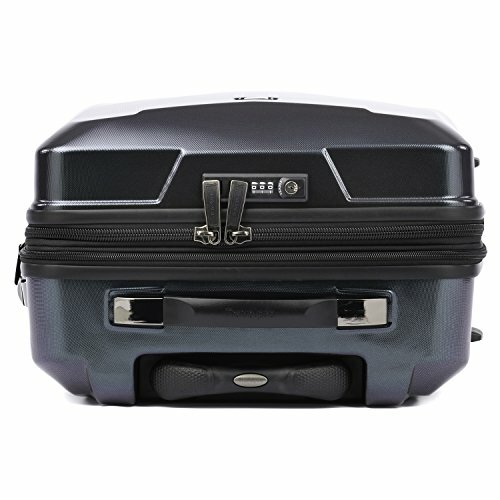 Some of Samsonite’s lightest bags are in their Omni line, with the carry on weighing only 6.8 lbs. This is exceptional, especially when you consider this line has hard shells, which are usually heavier than their softside counterparts. But they go even lighter with their Firelite and Cosmolite models. Their lightest bag of all is the Lite Shock, which is a mere 3.7 lbs for a hardside carry on. The Travelpro bags are also decent in terms of weight, especially in their Maxlite line. These come in both hard and soft shells, so you can pick your favorite. The Maxlite 4 21″ softside bag is only 5.9 lbs and the hardside version is 6.7 lbs. So, a bit heavier than some of the Samsonite models, but Travelpro is still a contender in terms of lightweight bags. Some people prefer the 2 wheel rolling bags while others like the versatility of a 4 wheeled spinner. That’s why so many brands offer both types of wheels on a wide variety of their bags, from small garment bags to the largest suitcases. If you’re comparing Travelpro vs Samsonite, you’ll see this refers to them as well. Both companies have added wheels to the majority of their bags. But Samsonite seems to prefer the spinners, sticking with their regular four dual multidirectional spinner wheels on many of their models. They also have a Tru-Trac wheel system, found on Silhouette Xv models. This system uses a V-shaped, caber instructed design, which is meant to keep the wheels rolling straight ahead. 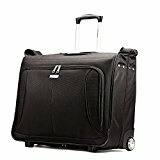 Travelpro adds both spinner and rolling wheels to the bags in their lines, and sometimes create two bags so they can use both. One example is their Crew 11 line, which has 21″ and 22″ hardside bags, the first a spinner and the second Rollaboard with two wheels. Travelpro has even created their own MagnaTrac technology, which is self-aligning for straight rolling. It may be tough to decide between Travelpro vs Samsonite in terms of shell material since both brands use similar types for both their hardside and softside models. For the hard shells, polycarbonate is most popular because it protects your belongings against impacts without ruining the exterior of the bag. Some types also protect against temperature changes, plus they don’t absorb moisture like fabric will. When checking out soft shell bags, the two materials you’ll likely find on these two brands are nylon and polyester. Nylon is a bit more durable than polyester, though neither should tear at the slightest bit of stress. The softside bags are also better for compressibility, so they will expand if you pack them a bit full, plus you can squeeze them in if you have to. Hardside bags may dent if you try this. Every bag is going to have handles on it, so it’s no surprise to find such necessary features when it comes to a Travelpro vs Samsonite comparison. But not all handles are created equal, so you need to look at what each bag offers to help make your decision. Travelpro makes their extendable handles out of sturdy aluminum on both their wheeled and spinner bags. These usually lock in one or two places to help you find the right position for your height. Samsonite also uses quality materials for their telescopic handles, but they offer more positions in the height, sometimes locking at every inch for the perfect fit. You also need to look at the carry handles before you buy your next bag. Carry handles on the top are standard, but some bags add one or two side carry handles as well. 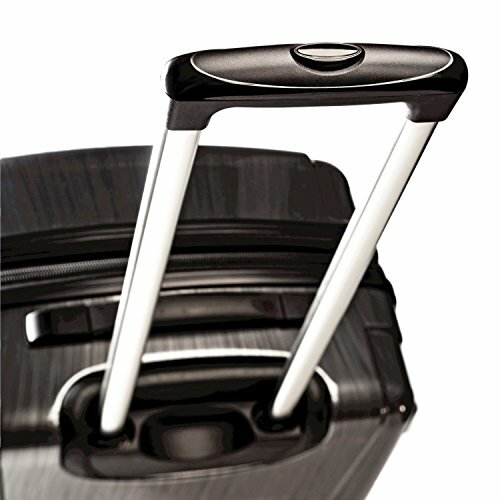 A bottom handle is also a plus to make it easy to lift your bag onto your bed, into a trunk, or up into an overhead bin. A bag needs to be durable, especially if it is not always in your care. Airport baggage handlers don’t always treat your bag in the most delicate manner. Simple bumps and scrapes can also occur at almost any time, so you need a bag that won’t be ruined at the slightest bit of action. Hardside suitcases are expected to be the strongest, but this isn’t always the case. They don’t handle stress well, especially if left under a heavier bag. This could cause dents or scrapes on the outside shell. Fabric bags handle this stress a bit better since the fabric can compress as needed, though they can be torn if mishandled. You also need to look at the seams of the bag to ensure they won’t come apart the first time you use it. Since corners and wheels will suffer the most impacts, these areas should be protected by some sort of plastic or rubber housing. You should also check the zippers to make sure they are high quality, or they may snag or break at the slightest bit of pressure. 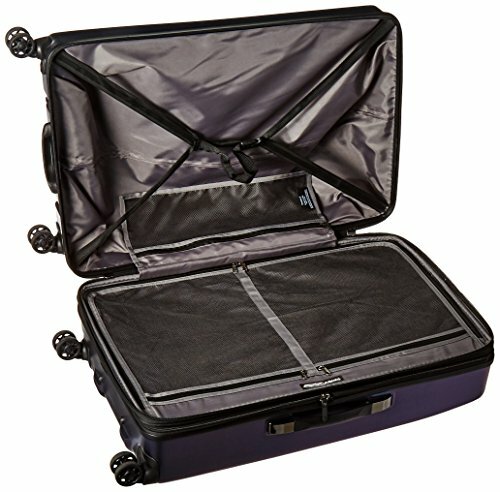 Another way Travelpro vs Samsonite bags are similar is in the storage space they provide. Depending on the line and size of the bag, you will get a large main compartment, and possibly a second one with a divider between them. Both brands also offer a wide range of pockets, both mesh and opaque, on the inside of the bag. They also have at least one exterior pocket as well for those items you want easy access to. One way Samsonite goes above and beyond is with their WetPak pocket, which is found on quite a few of their models in a variety of styles, including their garment bags, carry ons, and larger suitcases. These handy pockets keep liquids from soiling everything else you’re carrying. One of the most important things you need to be aware of when purchasing your luggage is the warranty. When you check out Travelpro vs Samsonite, you’ll notice some similarities in what each brand covers. Travelpro offers Worry Free warranty on their Platinum Magna 2 line. This covers defects in materials or workmanship, as well as any mishandling by airline carriers for the life of the bag. Many of their bags offer limited lifetime warranty, 10 year limited warranty, or in the case of the FlightCrew 5 line, 3 year limited warranty. These three warranties offer only coverage for material or workmanship defects but don’t cover any other type of damage. Just be sure to compare what warranty comes with your bag. Samsonite has a similar Worry Free warranty, but they do have limited global warranty, limited 10 year global warranty, and limited 3 year global warranty. This only covers manufacturing defects in either workmanship or materials but not any mishandling of the bag or normal wear and tear. 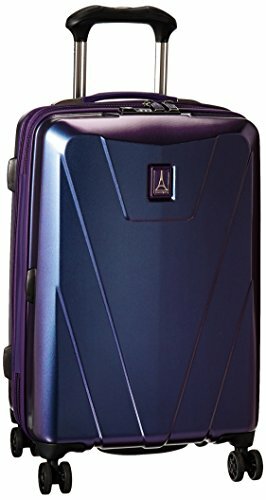 Unless you’re buying a Travelpro Platinum Magna 2 bag, the warranties for the rest of the bags are pretty similar. So, you may have to check out each bag individually when comparing the Travelpro vs Samsonite bags on your list of favorites. You may have noticed that one of the most popular colors for luggage is black. This is because black is sleek and stylish, matching almost anything else you’re carrying or wearing. But as we all know, it’s hard to find one black suitcase in a row of similar models, so you may want to try out a different color. Thankfully, most brands out there have added a variety of other colors to their lines. In fact, most brands have at least two or three colors to choose from, and sometimes double or triple that number. There are even some styles that add some patterned hard suitcases or softside bags to their lines for a bit of extra style. 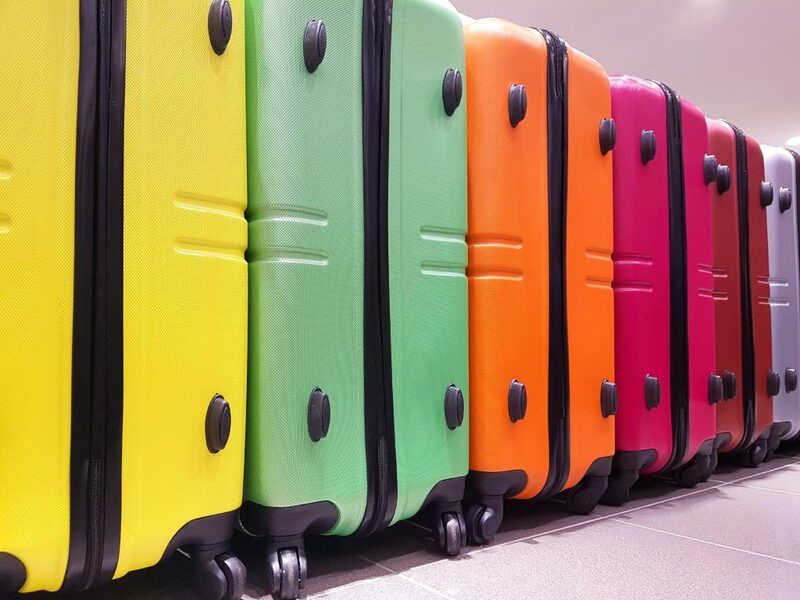 When you begin your Travelpro vs Samsonite comparisons, check out the colors each line has to offer. Though it may not be the most important feature on your list, it may help make your decision if you’re torn between two bags. If you’re on a budget, the price of luggage is going to be one of the biggest factors in your decision. Thankfully, both Travelpro and Samsonite suitcases are pretty close in price. In the bags we’ve reviewed here, the Travelpro lines are cheaper by roughly $30.00 or more in three of our categories, though. Only the Travelpro carry on bag was more expensive than the Samsonite comparison model. Of course, you also need to consider the features each bag has to offer. If the more expensive bags you’re looking at has more features, like padded laptop sleeves, extra storage pockets, or more handles, this could make it worth the price. The materials used for the shell, handles, and wheels could also factor in. So, you can’t choose your bag on price alone, even if you’re on a budget. Now you should know everything you need in order to decide for yourself which one wins in a Travelpro vs Samsonite luggage comparison. But we’ve picked our own favorites in each category, in case you need that extra bit of encouragement in either direction. For those who prefer the extra protection a hardside bag offers, the Samsonite Omni PC 28 Spinner comes in a few more colors and has that scratch-resistant coating. 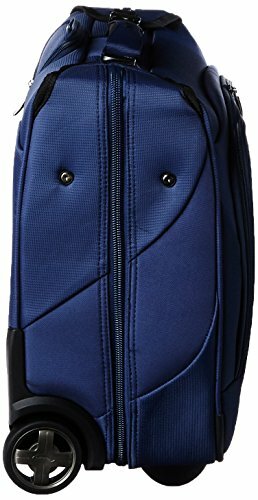 But the Travelpro Maxlite 4 Hardside Spinner gives you more storage pockets, more height adjustments on the handle, and is a bit lighter in weight. In the softside category, the Samsonite Silhouette XV Softside Spinner is water resistant and has that handy removable WetPak pouch. But the Travelpro Maxlite 4 Expandable Spinner wins again, thanks to its extra durable construction and the lower price for a larger bag. Our electronic gear has become a huge part of our lives. 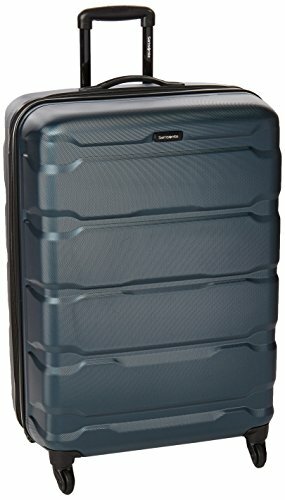 So, though the Samsonite Winfield 2 Fashion HS Spinner 20 is a great carry on with a lower price, the Travelpro Crew 11 line is a better option. This is due to the laptop and tablet sleeves on the smaller bag, and the USB ports for power banks and charge cords on the larger two models. The garment bag is the one category Samsonite comes out on top. Though the Travelpro Maxlite 4 Carry on Garment Bag is cheaper, with a stain resistant coating, the Samsonite Aspire Xlite Wheeled Garment Bag has more internal pockets to hold your belongings, one of which is a WetPak pocket to keep spills from ruining everything else you’re carrying. Still want to compare more luggage? Consider looking at Samsonite vs Delsey or Tumi vs Rimowa.